New tours of Bahrain have been announced to enable a growing number of visitors to discover more about the kingdom. As BTN’s Richard Cawthorne reports, they vary from day-long adventure treks to shorter trips catering for special interests to give an introduction to the country. Taking the Ultimate Bahrain Tour is a good way to get to know the lie of the land in this desert kingdom. A blend of the traditional and the contemporary, the package combines two other offers, the Desert Oasis and City Sightseeing tours to let visitors experience the quintessential Bahraini feel. As a bonus, participants can splash about at the fun filled Wahoo! waterpark with a full-day pass for free. Our tour begins at 09:00 at the Bab Al Bahrain, the main entrance to the souk in the capital, Manama, to appreciate the historic architecture. From there, we head for the first site – the A’Ali Burial Mounds – to recollect memories from a time long ago and take pictures at the oil fields in testimony to Bahrain’s economic development. Next is Sakhir, where visitors say hello to the desert’s best friend at the Camel Farm, housing the royal camels and falcons. 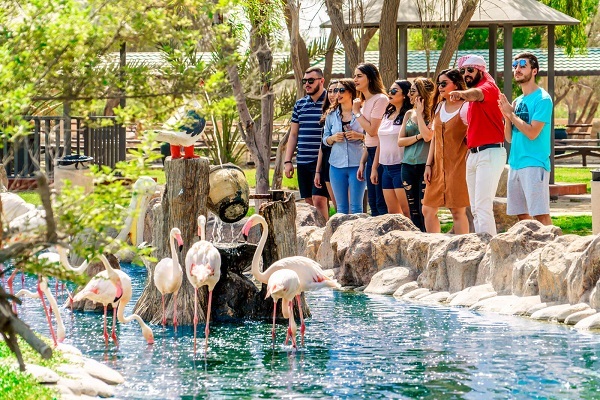 After greeting the friendly animals, the tour moves on to admire native Bahraini species at the Al Areen Wildlife Reserve, also known for housing animals from Africa and South Asia. After the wildlife reserve, it’s on to the Bahrain International Circuit (BIC) for behind-the-scenes access to the Bahrain Formula One Circuit and soon after, a stop at the world’s tallest indoor skydiving tunnel to witness and in some cases take part in a free fall in a 12m high wind tunnel. Hunger pangs are satisfied with a traditional Bahraini lunch at Haji’s Café, one of the oldest traditional restaurants in the city and then it’s on the next stop at the Bahrain World Trade Centre – futuristic sail-shaped wind-turbine powered towers that count among the best of the tour’s photo opportunities. After capturing the contemporary spirit of Bahrain, the tour proceeds to the grand ‘Masjid al-Fatih’ or the Al Fateh Grand Mosque to gain an insight into Arabic culture and admire the Kulic calligraphy and fibreglass dome that ornaments one of the biggest mosques in the world. 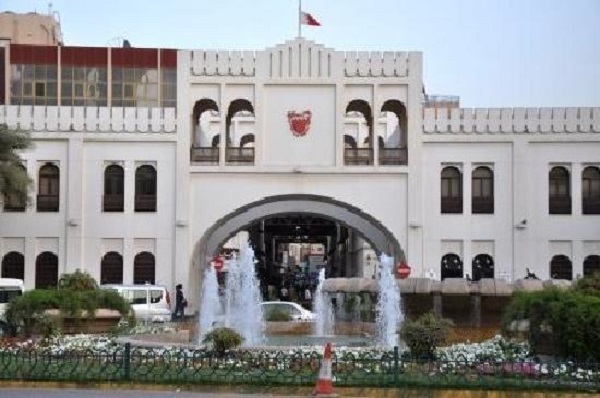 The historical theme continues at the Bahrain National Museum for an overview of the rich history and culture of Bahrain, before it heads to the Muharraq old houses to revive tradition and take a bite into the delectable Bahraini ‘Halwa’ at one of the authentic sweet shops at the Muharraq souq. Deserts are usually perceived as barren and uneventful places, where the passing of time is visible only through the ever-shifting dunes but Bahrain is anxious to show this is not so. There are scenes reminiscent of the Arabian Nights combined with historic sites and adrenaline-infused activities, with Sakhir claiming to be one of the most thrilling deserts to be found. For visitors with limited time, the Desert Tour is a half-day introduction to the main sights, starting again at 09:00 at the Bab Al Bahrain and taking in A’Ali and the oilfields, the camel farm and the Bahrain International Circuit. Adding to the activities line-up, AtBahrain has launched the new Southern Adventure Tour, giving visitors the chance to experience the state-of-the-art activities set in the south of Bahrain. The tour runs from 14:30–17:30 and includes two adrenaline-filled activities, a trip to Bahrain’s Gravity Indoor Skydiving centre followed by speeding around corners at the country’s International Karting Circuit. Meanwhile, bringing things right up to date, Bahrain has announced it is set to receive 15 new hotels and beachfront resorts by 2020, representing a collective investment of more than $10bn and, say officials, putting it firmly on the map as a competitive business destination. The new arrivals include top hotel brands such as One&Only, Wyndham, Fairmont, Vida, The Address, Ibis and Pullman, each set to make an entrance over the next three years. They will find themselves in good company as they join the destination’s other big names such as the Ritz-Carlton, Four Seasons and Sofitel and adding to Bahrain’s existing portfolio of more than 190 properties. That total includes 18 5-star, 48 4-star and 35 3-star hotels, 81 serviced apartments and 11 resorts. Between them offering a capacity of more than 16,500 rooms for visitors. Not to be outdone Gulf Air, Bahrain’s national carrier, has also announced a host of future plans geared towards its ongoing growth, development and long-term expansion capabilities. Planned developments include an incoming fleet comprising 10 Boeing B787-9 Dreamliners, 17 Airbus A321neos and 12 A320neos, with deliveries from Q2 2018. The airline says the new fleet is at the heart of its business strategy to strengthen its position further as a key national infrastructure asset and support the kingdom’s economic growth. This is a thoroughly unpleasant feudal Monarchy, with an especially bad Human Rights records. What on earth are you doing promoting Bahrain? An otherwise excellent newsletter.